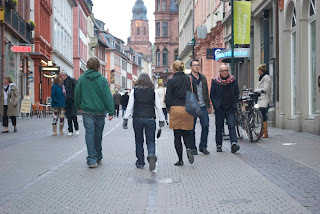 Some of the best strolling streets around! 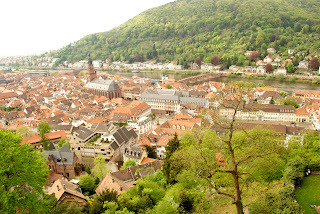 For mere pocket change, you can jump a smooth, immaculately kept train, sit back, and watch the beautiful countryside stream by, then alight in one of Germany’s most picturesque cities, Heidelberg, a magical place that comes complete with a swiftly flowing river, an ancient university and an anciently matching downtown. 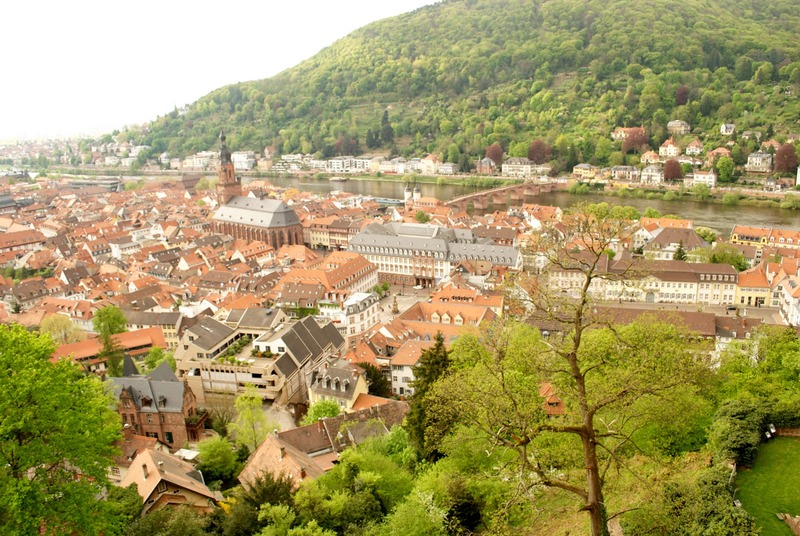 Much of Heidelberg's old section hasn’t changed since the 17th Century. Do your job! 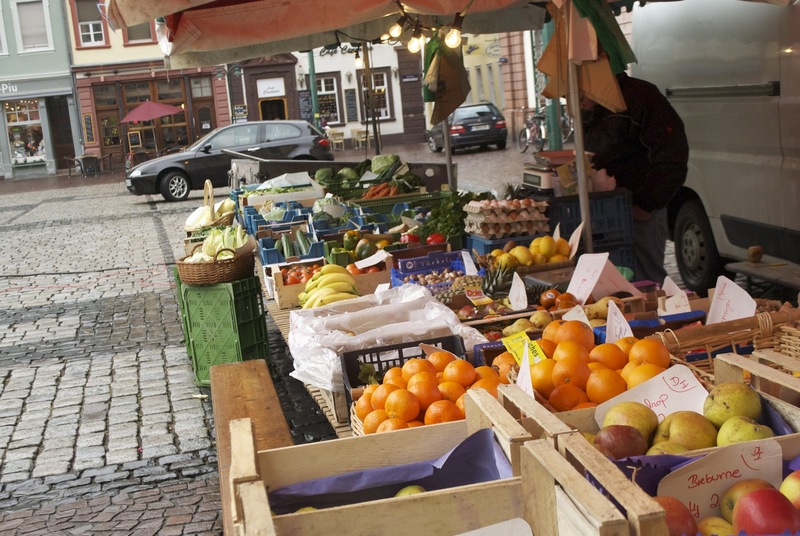 Get off the beaten track and get lost in those twisty, turny lanes. Have a quiet, unhurried lunch at a quaint restaurant, and let some of that famously delicious wine roll down your tongue. 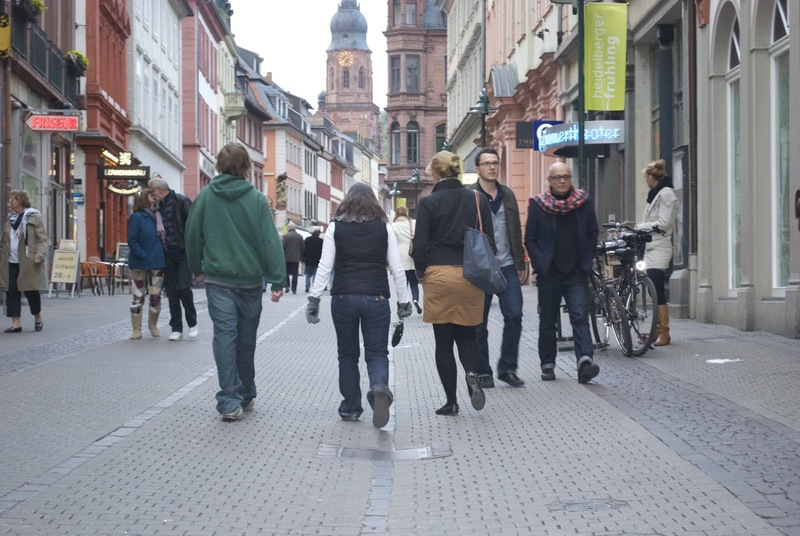 Stroll the cobblestone streets. See the old bridge (and the monkey), the Church of the Holy Spirit, those waist altering pastry shops and open air produce vendors. Ho-hum, just another glorious day trip in Deutschland. No telling Heidelberg’s real age. When the Romans arrived, the Celts had already settled and left. When the Germanic tribes pushed south, the Romans pulled up their tents, stopped building roads and baths, stone cities, and Fiats and headed back to Rome. But, pre-historic people were here even before that. In 1907, a jawbone of Homo heidelbergensis was discovered that dates to about 500,000 B.C.E. I know what you’re thinking. If you can give us an age for an old codger born half a million years ago, can you offer a guess about the university? And, we ain’t talkin’ about the one in Tiffin, Ohio! Ok. You win. 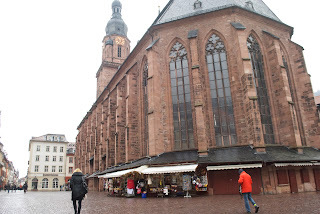 Heidelberg University was founded in 1386, making it the oldest in Germany. Today, it’s a thriving, research oriented school, and Fifty-five Nobel Laureates are directly associated with either the university, or the city. There’s a big foreign student population and you’re likely to hear dozens of languages all over the city. But, there’s more to the Alt Stadt (old city) than just the university. 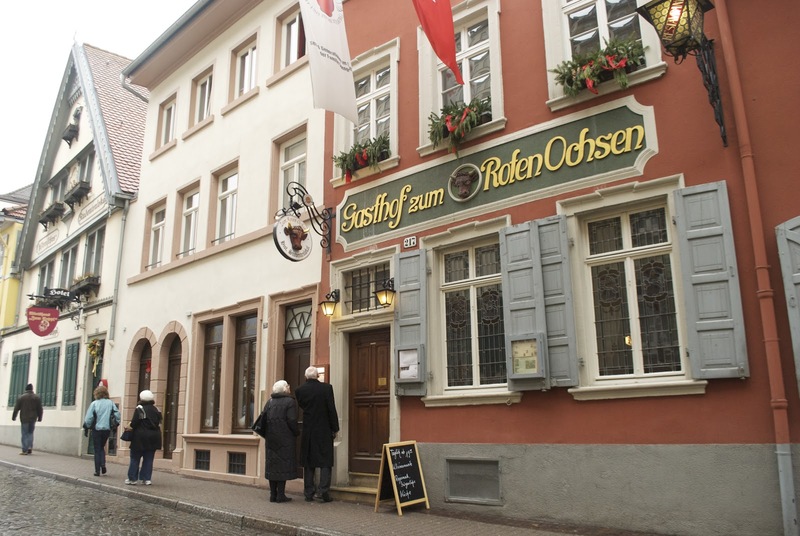 As you might guess, where there are students, there is beer and Heidelberg has two very famous student pubs, Zum Roten Ochsen (The Red Ox Inn) and next door, the student tavern Stepp’l. 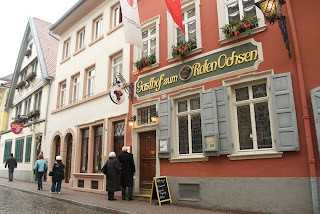 Bismarck, Mark Twain, John Wayne, and Marilyn Monroe all tossed back a brew or six at Zum Roten Ochsen, so you’ll be in good company. Heidelberg’s place in history keeps growing. Take the old bridge, actually named Carl-Theodor-Bridge. Built in 1788 to replace many wooden bridges built and destroyed by floods over the years, it was again destroyed by German soldiers in 1945, only to be rebuilt in 1947. 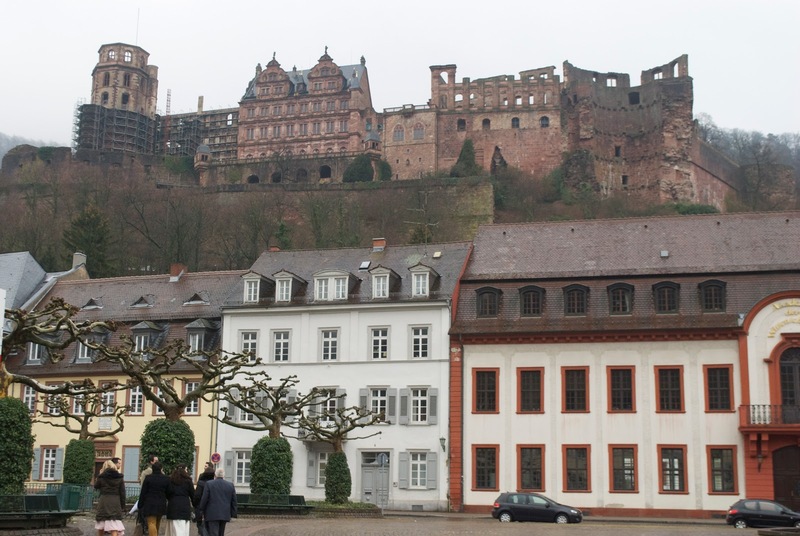 But, the centerpiece of Heidelberg is the grand and prominent castle/palace overlooking the Neckar River and old city center. Because the Königstuhl (king’s throne), the hill sitting about a hundred meters high, offers both a commanding view and relative security, the Celts, the Romans, and the more modern rulers all built fortresses, churches, and other buildings there. The ruins you see were constructed, destroyed, and reconstructed over a period of over four hundred years. The French forces of Le Roi-Soleil, Louis XIV, did real damage during the War of the Palatinate Succession. One of the back towers looks as though it were cleaved by a giant sword. Over the centuries, lightening strikes also took their toll. When you visit, don’t miss the Grosses Fass (big wine barrel), holding 58,000 gallons, or 221,725 liters. Next to the barrel is a wooden statue of Perkeo. Ask about him. The Apothecaries' Museum is another charming spot of pots and potions. Glance at the courtyard fountain, with columns from the palace of Charlemagne, who, in addition to all that killin’, plunderin’, and pillagin’, famously said, “To have another language is to possess a second soul.” Still searching for that second one, bro. When you walk through the restored gardens, remember that the German writer, Johann Wolfgang von Goethe walked there, too. The garden may have been what he referred to when he wrote, “Beauty is everywhere a welcome guest.” The beauty of the castle continues with stage productions during the year, including The Student Prince. (Check schedule). To get to the castle, you can walk, or take the funicular (chain pulled) railway. The castle is open 8:00 a.m to 5:30 p.m. daily, but check for the particulars before you go. Hey, stollin’ all those streets, seein’ those sights, climbing to the castle, all develop a healthy thirst. Time to head to the Roten Ochsen. Prost! Doesn't anybody work in your house? 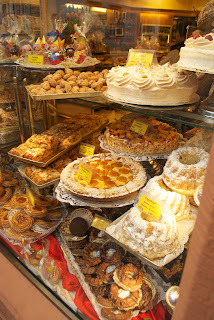 Ah, but the weekends are sooooo nice!